In my neck of the woods there’s a saying that pertains to endangered species; “shoot, shovel, and shut-up.” Interestingly, in the case of the rare (and not too cute and cuddly) Amargoso toad, ﻿the local folk are working hard to protect it. A small environmental miracle has occurred in Beatty, Nev., a former mining town that sits on the eastern edge of Death Valley between Jackass Flats and Sober Up Gulch. The people of Beatty have helped revive the Amargosa toad, a warty, speckled, palm-sized creature that’s unique to the area and, just a few years ago, seemed headed for extinction. But this is not your typical story of environmental action — the toad owes its comeback to an unlikely coalition that includes ranchers, miners, off-road racers, opponents of big government and the local brothel. “What you’re seeing tonight are the results of active land management, active habitat management,” says rancher David Spicer. He has run miles of underground pipe around his property to create breeding pools and wet habitat for the toads. Spicer grew up with the toads and wants to preserve them, he says. But here’s the surprising thing: Another reason, and perhaps the major reason Spicer has gone to such lengths is because he really, really does not like the Endangered Species Act. “Nobody trusts the government anymore,” Spicer says. “Nobody wants to work with the government. The government always wants to take something from you.” So Spicer got worried more than a decade ago when some scientists declared that there were only a few dozen Amargosa toads left. Soon after that, when a group petitioned the federal government to add the toad to the endangered species list, Spicer came up with a plan. 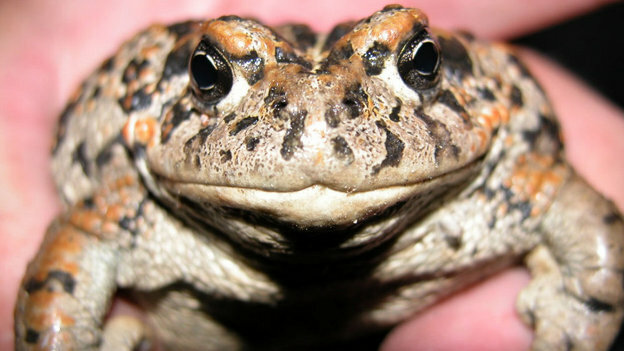 Spicer feared the government would try to protect the toads by telling him he couldn’t raise cattle or ride off-road vehicles on his own property. So he helped start a group called STORM-OV, which stands for Saving Toads thru Off-Road Racing, Mining and Ranching in Oasis Valley. « Why are U.S. Taxpayers Paying Brazilian Cotton Growers?